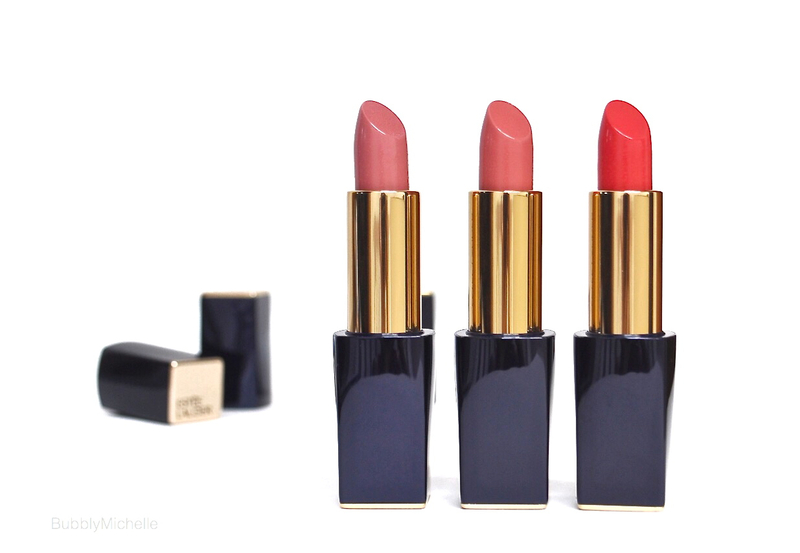 Last year Estée Lauder launched their Pure Colour Envy lipsticks garnering much excitement within the beauty community. It’s been a while since they revamped their lipsticks and it was big news. Needless to say, I was VERY interested. Sadly these highly pigmented full coverage lipsticks never made it to the Asian market, leaving all fellow beauty addicts desperate and reaching out to their allies in the west to send some over! Luckily I managed to pick up my very first one, Insatiable Ivory on one of my trips to London and have been eagerly awaiting their launch in Asia. 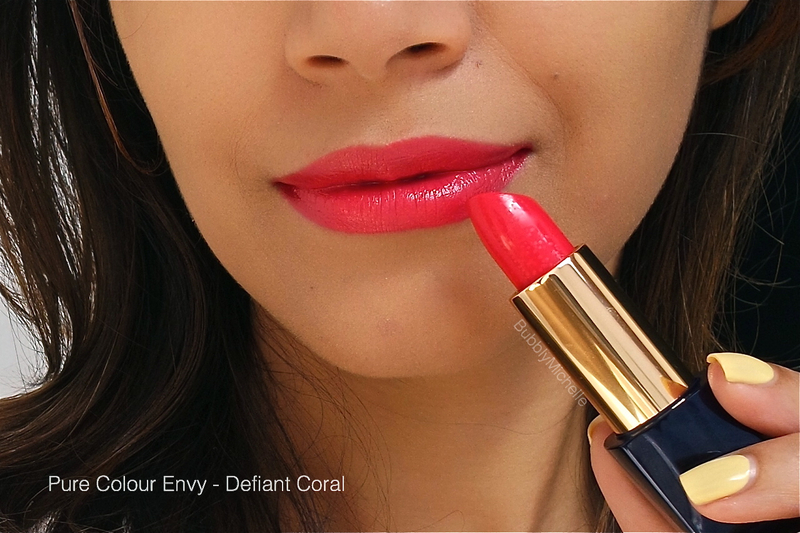 At long last, here’re the glorious, Pure Colour Envy Sculpting Lipsticks. 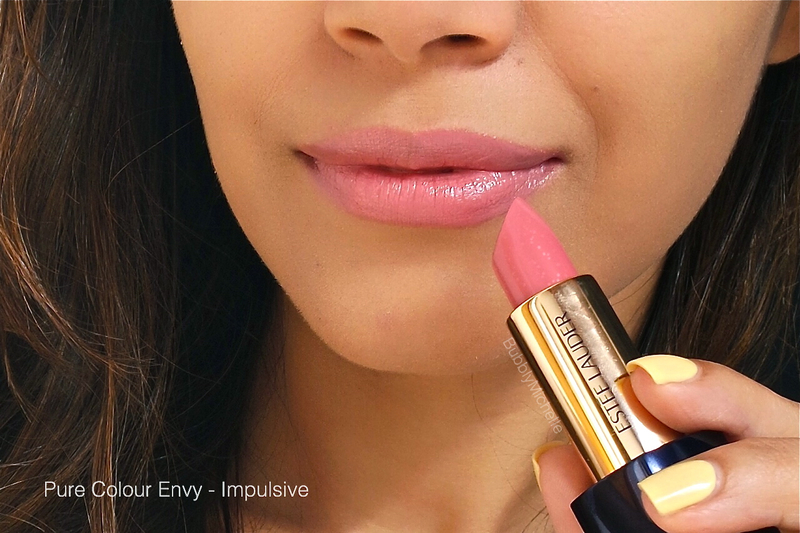 Impulsive – A neutral, light muted pink. 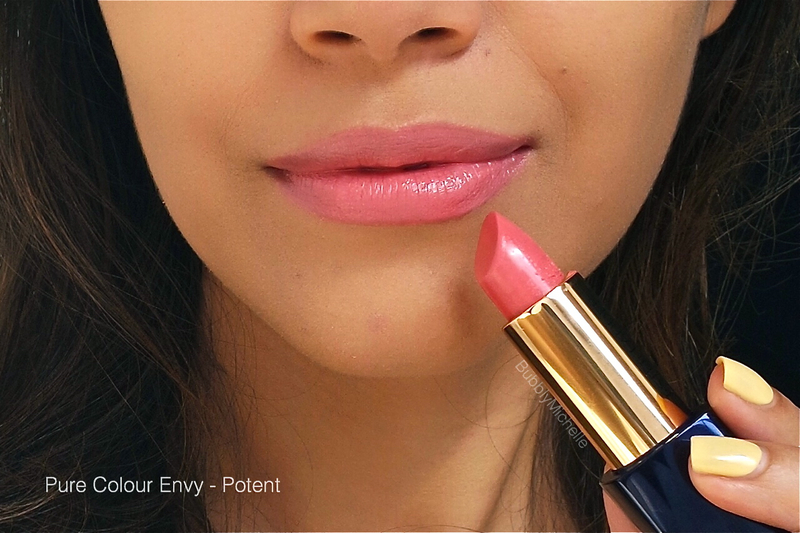 Potent – A neutral, peachy pink. As always, firstly, let’s take a look at the packaging. These lipsticks come housed in sleek navy blue packaging accented with classic gold details enabling tasteful logo placement on the cap. The barrel too now carries the logo, a nice touch which I wouldn’t consider overkill. The closure is now a magnetized one, clicking firmly into place. Another welcome feature that ensures our handbags stay safe from ‘Lipstick Graffiti’. 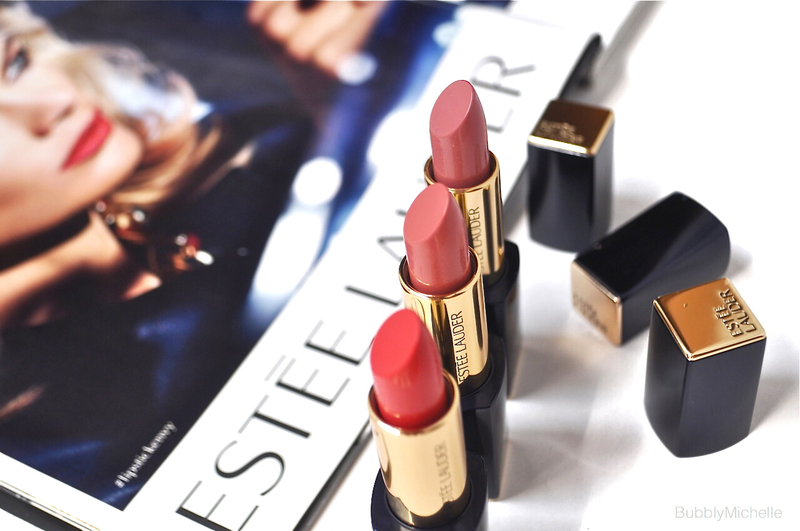 The overall look & feel of these is definitely more modern and sleek compared to the older Estée Lauder lipsticks. These lipsticks achieve maximum opacity with 2 strokes, covering the lips evenly, leaving it glossy and full. What I like most about these though is that they are very comfortable when worn. They contain a ‘Time Release Encapsulated Moisture Complex’ with Hyaluronic Acid which keeps lips hydrated and supple throughout wear. When compared, these feel much more creamier than the MAC satin finish lipsticks and are more along the lines of Tom Ford. I found them suspiciously similar to Tom Ford actually, in terms of pigmentation and texture. Little surprise though given that they are both under the same Estée Lauder holding company! These lipsticks can last from 4-6 hours depending on the shade you pick, with the darker ones lasting easily towards 6 hours with a bit wearing off just around the center of the lips leaving a mild stain. I also noticed that these lipsticks don’t leave that horrifying white rim whilst wear. 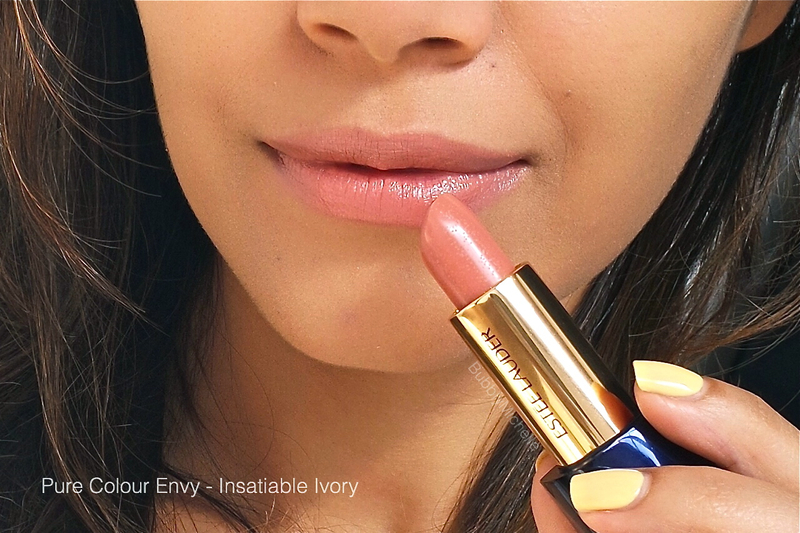 So you won’t have to keep checking your lipstick regularly to fix this problem. Basically when I wear these, I just get on with my day and forget about them. No reapplying. Moving on, here’re some comparison swatches I put together. I hope you find them useful. These lipsticks are serious business. From pigmentation to wear, I had nothing to complain about. They offer vivid colour that lasts and lasts and have been my go-to this whole month. I highly recommend these and if you are on the lookout for long wearing lipsticks for office, they are something you need to check out. 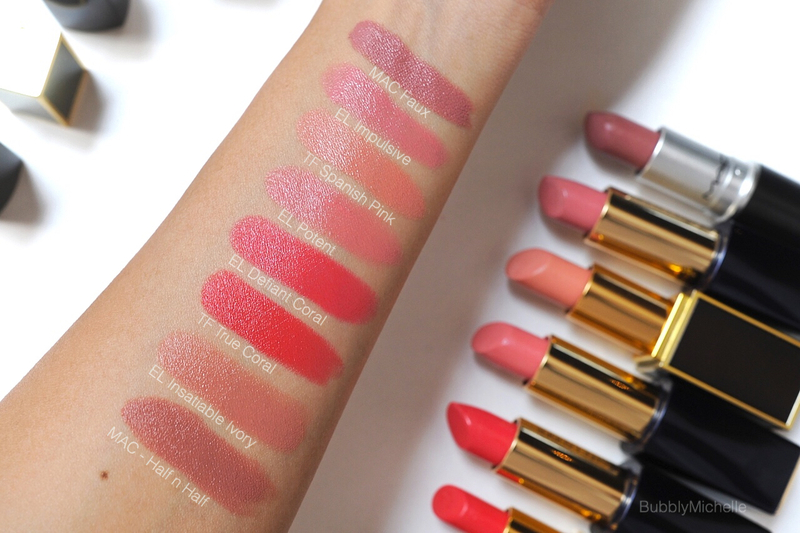 *P.S- before I forget, these new EL lipsticks have a very faint vanilla fragrance. No longer the heavy fig scent in case you wondered! These retail at SGD 45 each and are currently available at all Estée Lauder counters. Singapore carries 16 of the 20 shades released and come in 4 different colour families. Wishing you an amazing kick off to the week! so happy that these have become readily available in Sg! like this you can use them at ease! also enjoy your evening and have a lovely weeK! Each swatch is prettier than the next! Beatiful shades and they lay on lips very nicely! Thank you! And thank you for stopping by, you are so kind Stacey 🙂 And I too love the formula of these.. ❤ beautiful products!